Dr. Rogie Belen welcomes all nationalities for consultation. With special emphasis on Preventive Medicine, acute and chronic care. 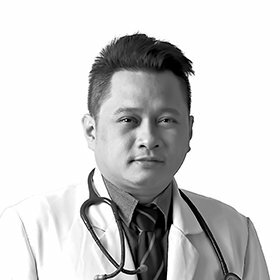 He is a graduate of the University of Visayas- Gullas College of Medicine in Cebu City Philippines. He had his Specialist training for Internal Medicine in Perpetual Succor Hospital, Cebu Philippines. He was able to finish a study which was published by the Journal Of Neurologic Sciences titled “ In hospital Neurologic Complications in Adult Patients Following Open Heart Surgery in a Tertiary Hospital in Cebu City Philippines”. This research was a finalist in the 2015 Neurologic Conference in Chile. He has gained experience in different facets in the health care industry. He specializes in Critical Care Management, Adult Acute and Chronic Diseases, Occupational Health. Pediatric, Adolescent and Geriatric medicine. Has special interest in Cardiology, Allergology, Nephrology, Rheumatology, Rheumatology, Oncology ,Pulmonology (asthma and COPD), Dermatology, Diabetes Mellitus (type I and II), Adult Immunization, Endocrine (thyroid Diseases) and Neurologic Diseases (stroke prevention and management).